I've always found that the more restrictive and limiting the circumstances, the more creative I can be. Todays' challenge was to design and build the bathroom stall enclosures for the Fox and Hounds Pub. The owners didn't want ordinary. And they were adamant I could come up with something creative. We looked at the common problems of this type of project. The hardware of commercially available stalls is typically not very sturdy. Grafitti and vandalism was the norm. And we didn't want a typical look. This was a special place. So I first went back to our story. This is a British pub. We feature the crown and the Union Jack in other places.... hmmmm. Then the light went on. 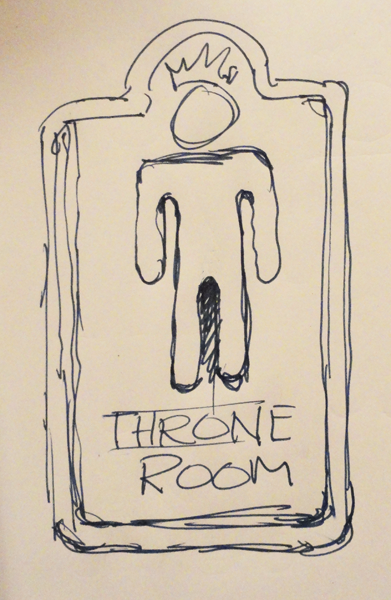 I've often heard of the bathroom being referred to as the 'THRONE ROOM'. What if we featured 'his highness' on the men's room and 'her highness' on the ladies. The signs on the doors would feaure an ornate crown of course, in typical regal style. The mirrors will get the 'royal treatment' as well featuring another crown of course. A quick, scribbly sketch put that idea down on paper late last night before I went to bed. On the doors we'll keep it simple. We'll use the international symbol for Men's and Ladies, with the addition of a similarly styled crown. Underneath we'll lable them the 'throne room' - just for fun. Then it was time to extend the theme to the bathroom stalls... Why not build a crown on the front corners? It had to be bullet proof of course. I scrounged trhough my scrap and parts bins in the shop and gathered bits and pieces of all descriptions. Then I started welding. 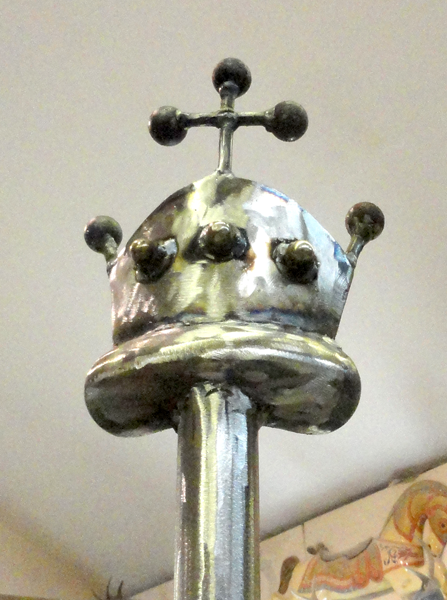 Before I knew it there was a crown - fit for a king or queen. For the stall handles we'll build some miniature scepters. The stalls will be raw and a little rusty steel when we are done. All will be heavy duty and well able to stand up to whatever our royal guests throw at it in the next years.